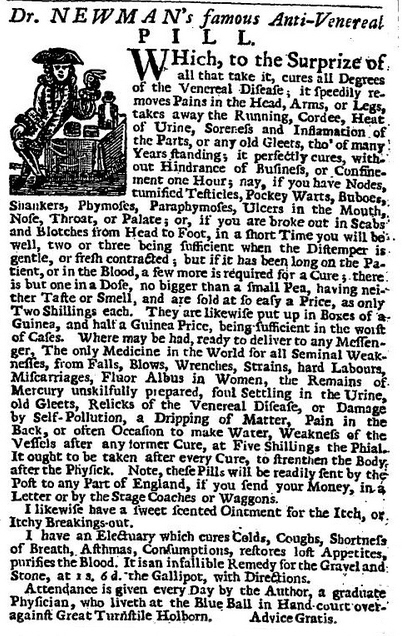 Eighteenth-Century Patent Medicines: Kill or Cure? Recently, someone tweeted an image of a label of Victorian cough-medicine, showing its main ingredients were cannabis, cocaine and chloroform! I imagine it didn’t so much stop your cough as render you swiftly insensible to any kind of throat-tickle – and everything else as well. During the eighteenth century, most medicine was composed of little more than laudanum, hope and some fairly wild theories about what caused diseases in the first place. This is not to look down my 21st-century nose at the efforts of our forebears. They did what they could with what was available to them. Along the way, they started to make some of the key discoveries on which modern medicine is based. However, the plain fact is that most university-trained physicians’ fees were far beyond the means of anyone but the gentry. Surgeons did what their name implies: they operated, without anaesthetics of course, and tended to be a place of last resort. For the rest, the ‘middling-sort’ and the artisans visited the local apothecary. The poor, lacking any means of cash payment, probably turned to a ‘wise woman’ for some herbal or other brew that might do them a little good, paying in kind with a few eggs, a poached rabbit or a handful of vegetables. And thus it goes on, adding that those unlucky enough not to be able to consult with Dr. Freeman in person in Holborn, could obtain the same medicines at Messers Stevenson & Matchett, Norfolk Arms, Market-place, Norwich – presumably without any kind of consultation at all. Not only had GUTTA SALUTARIS been used by officers of the Royal Navy and Army (probably eager for cures for venereal diseases, I expect), it had “…cured 30,000 people in the previous 16 years…” and was available in various-sized bottles costing 22 shillings (£1.10p), 11 shillings and 6 pence (55.5p), 5 shillings and 5 pence (26p) and 2 shillings and 9 pence (13.5p). With an artisan likely earning 12–15 shillings or less per week, even these prices were probably out of their reach. Attempts to control the practice of medicine were long hindered by the mutual suspicion between the various branches of the profession, with the university-trained physicians looking down on mere ‘barber-surgeons’ and apothecaries, whose training – if any – was gained through the traditional process of hands-on apprenticeships. However, public demand for some help in threading the maze of competing claims seems first to have been addressed by the publication of directories or registers of medical practitioners in the early 1780s. In 1780, as expected, the ‘lower’ branches of the medical professionals greatly outnumbered those with more extensive training (and higher fees), but nowhere was the provision of medical advice and support anything like adequate. In East Anglia, there were seven surgeon-apothecaries (86.4 per cent of the recorded total) for every one physician (12.6 per cent), but still only a single practitioner of any type for every 2000 of the population. It was no wonder that many poorer people relied on patent medicines or the advice of locals believed to have folk or inherited knowledge. In the end, it was commercial competition which brought about reform. As the physicians retreated further into their closed enclave of specialisms, rich patients and high fees, many apothecaries began to fill the gap left by acting more as GPs than just compounders of medicines. That left another gap below them, which was being filled by all kinds of chemists, druggists and even booksellers, peddling patent medicines without any medical or pharmaceutical training. Alarmed by the threat to their own good name, the apothecaries emulated the physicians in constructing a closed-shop around their profession. The campaigning London apothecary John Mason Good co-founded the General Pharmaceutic Association of Great Britain in 1795, with the intention both of setting minimum standards and applying pressure for proper training and regulation of all who claimed the title of apothecary. Even so, it took until 1815 for Parliament to take action to stem the dangerous free-for-all in handing out pharmaceuticals. While The Royal Colleges of Physicians and of Surgeons stayed on the sidelines, playing no role in establishing suitable regulation, a bill for regulation was passed, though not without great difficulty. Parliament merely agreed on a distant kind of control, establishing a legal framework within which The Society of Apothecaries was licensed by statute to establish a proper system of education, examination and registration for its members, and act thereafter as a self-regulating body for the profession. Throughout the eighteenth century, apothecaries and surgeon-apothecaries acted as the front-line of professional health care, gradually extending their role from drug-makers and dispensers to GPs for a whole community. In doing so, they helped establish much of the pattern of the UK medical profession as it exists today, with its clear distinction between specialists and consultants, GPs and pharmacists. Though successive legislation has greatly restricted the range of medicines that may be sold freely by non-specialists, we still have hundreds of patent medicines available and many who rely on them for minor ailments. We even have something of the activity of those professing skill in folk-medicine and herbal remedies. So-called Alternative Medicine is, in many ways, a modern version of looking to traditional cures instead of the chemical-based pills and potions sold in every High Street chemist. Plus ça change, plus ç’est la même chose. 2 Responses to Eighteenth-Century Patent Medicines: Kill or Cure? Great post, William! And so glad you provided cites. Medicine has come a very long way – as has government regulation of medications. Even so, I’ve often thought that one hundred or more years from now they will look back on some of the medicines and supplements we take today with horror. Thanks, Mimi. I have more research on this topic, which will probably surface in future posts.